Before I begin this review I'm going preface it with that these were all chosen at the beginning of my beer journey. Obviously I could have picked better/craftier beers, but for the most part I didn't. I'm going to compare what I said last time to what I think now. 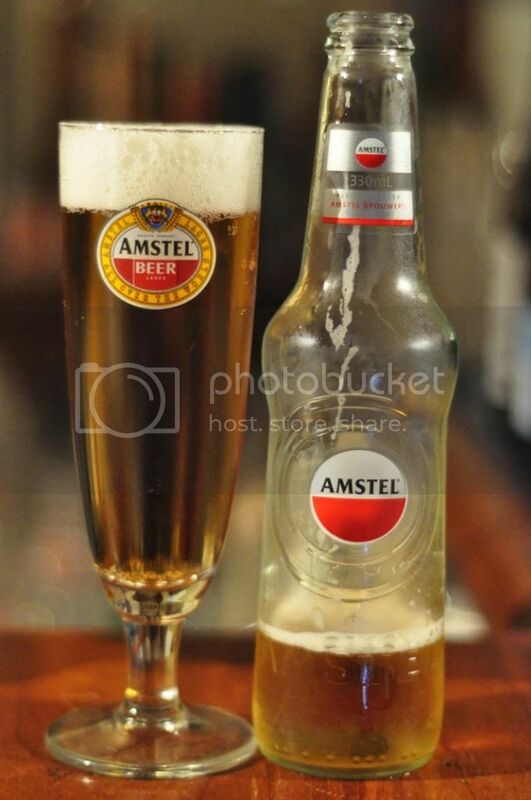 First up is Amstel, let's do this! Despite the disgusting clear glass bottle (I HATE clear glass bottles!) the beer actually looks quite good for a lager. It's a nice clean golden colour and has a brilliant white head. The head had a number of large bubbles in it and dissipated quite quickly although my Amstel glass has alot of lacing left in it so it clearly laced the glass well. Most importantly here the aroma is not skunked! I repeat this clear glass bottle has absolutely no skunky aromas! To me this is incredible for a beer actually imported from Holland. In fact it had almost no aroma at all. There was a small hint of malt on the nose but there were no hops detectable at all! This beer was remarkable for it's complete lack of aroma. O.K. despite a positive start I remember why I wrote what I did last time. This really is not a great beer. In terms of flavour it is very very light on! What little flavour there is is not great; there's some mild sweetness early which fades into a nasty metallic flavour. The flavour of this beer is more like soda water than anything else, really not good at all. So I think I was pretty close with my initial short review of Amstel. The beer is very light in flavour and I honestly wouldn't recommend anyone spending their money on it. I was once told that this beer should be served with a slice of lemon, like Corona, so I did try it and didn't think it improved it that much; although it did mask the nasty metallic flavour. There is no way I'd recommend this one to anyone, but look if you have to try it please let me know below what you think.